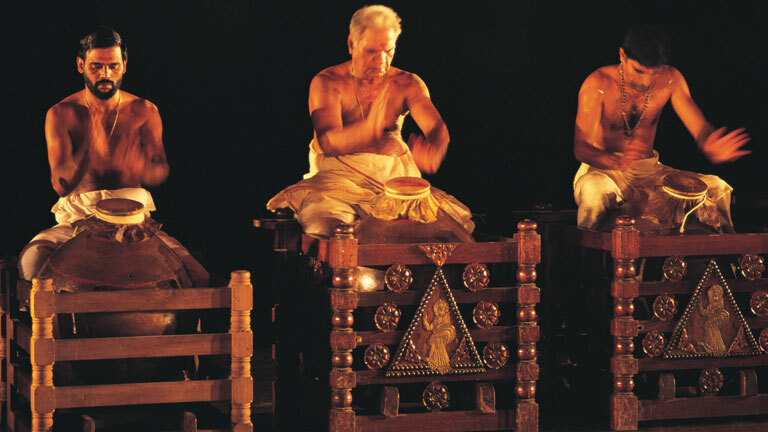 Mizhavu is the main accompanying percussion instrument for the art forms Koothu and Kutiyattam. This anavadhya vadya resembles a large pot. Earlier, the instrument was made of clay which was later replaced by copper. The Mizhavu is basically a large copper pot which has wet calf skin tightened around its mouth. The tone of the instrument increases as the skin dries up. It is played with the palm and fingers. Mizhavu is referred to in the classical text Cilappatikaram. It is considered as the idol in a Koothambalam and is regarded as Brahminic and the important rituals in the life of a Brahmin like the Upanayanam are performed for the Mizhavu also. The mizhavu is kept in a wooden box (known in Malayalm as Mizhavana) so that it does not touch the floor. When it becomes unusable, the instrument is ceremoniously cremated on the temple premises. Mizhavu is sounded during the end of the second and fourth lines of the slokas and throughout the performance. Mizhavu has a prominent role in the origin of a popular art form, Thullal in Kerala.